We are a premier supplier of hollow pin roller chain and more. We stock ANSI, ISO, DIN, Metric, Stainless Steel, Nickel Plated, Double Pitch, as well as conveyor series hollow pin roller chain. What sets us apart from other suppliers is the array of quality options and in-stock items we offer, along with some of the most knowledgeable customer support staff in the industry. Hollow pin roller chain is used in a wide range of applications ranging from light to medium conveying applications, drive applications, bakeries, circuit board manufacturing, elevating conveyors, as well as many more. On top of the hollow pin roller chain, we offer a full line of high-quality sprockets, belting, motors, gearboxes, bearings, sensors, and more. For more information on hollow pin roller chain or to get a quote, please contact us and we will be happy to assist you. 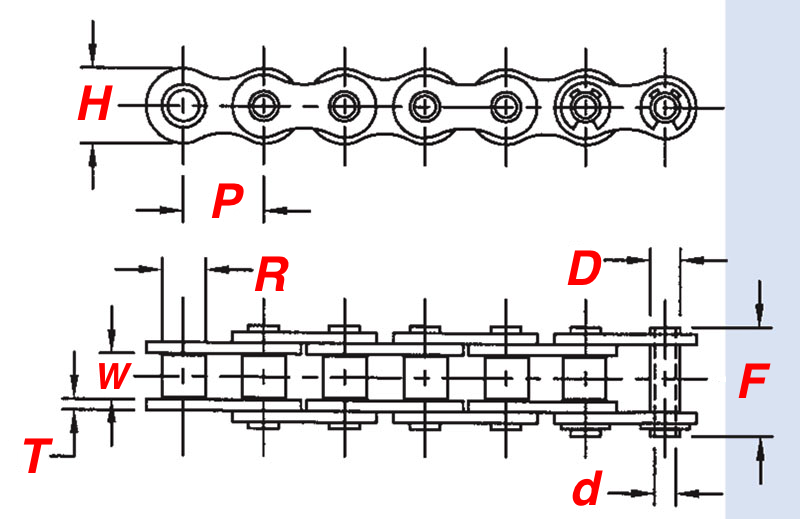 What Is Hollow Pin Roller Chain? 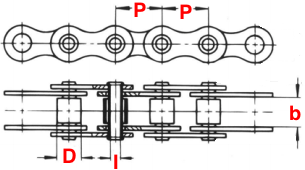 Hollow pin roller chain is essentially the same thing as a standard roller chain just with "hollow-pins". This not only decreases the chain weight, but it also gives you the ability to place extended pins through the chain for conveying product. Many applications include; bakeries, overhead conveyors, elevators, poultry, agricultural, and a wide range of other applications. C2042HP 1.000" 0.313" 0.625" 0.221" 0.157" 0.689" 0.689"
NOTE: Part numbers beginning with SS are stainless steel. Breaking hollow pin roller chain has never been easier than it is when you use the hollow pin chain breaker. Working in both full-on production line applications and simple day-to-day breaks the breaker will surely impress. We also offer a hydraulic version of the breaker with a pneumatic foot pedal for even easier breaking. 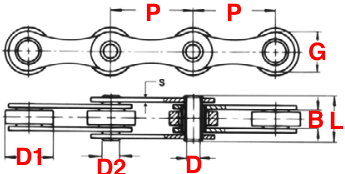 Because hollow pin roller chains conform to ANSI, DIN, or ISO standards, they can be used with standard ANSI, DIN, or ISO sprockets. We keep a full line of ANSI and metric roller chain sprockets in-stock in a range of bore sizes and hub types. USA Roller Chain is a one-stop-shop meaning that you can get anything from the electric motor to conveying chains from one convenient vendor. Not only does this save you time, but you are also saving on shipping, and getting a good consistent quality of product. To get a quote, please contact our sales team at sales@usarollerchain.com or call (407) 347-3519.